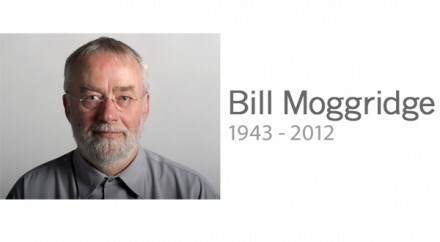 Devastating news reaches me that Bill Moggridge has died. Many readers here will know that Bill Moggridge had been director of the Smithsonian’s Cooper-Hewitt, National Design Museum, since 2010, and this was the latest chapter in an illustrious and history-changing career. The Museum has just posted a fine tribute to Bill’s life and work here. I’d known Bill for 25 years. I first met him when, as an opinionated and ill-informed design journalist in London, I confronted him with a bunch of dumb questions about ‘computer design’ at a professional event. At that first encounter, despite the foolishness of his interlocutor, Bill was insightful, friendly, and utterly unpretentious. As the years passed, and we became friends, he was unfailingly kind and supportive whenever our paths crossed. Time and I again, I would marvel at his genuine interest in the work and ideas of everyone he met – especially the unfamous ones. I can’t imagine how many young designers have begun a conversation with Bill in a state of confusion and self-doubt – only to conclude it with the conviction that they, and their ideas, mattered. He had a rare gift of empathy, and a unique capacity to make people feel good about themselves. Many others will testify to Bill’s unique talent as a designer, and the significance of his role as co-founder of Ideo. My own fondest work-related memories concern the role he played during the creation of Interaction Design Institute Ivrea, in Italy (where this writer was on the steering committee). As Franco Debenedetti navigated the ineffable waters of Italian business and politics, and Gillian Crampton Smith crafted her inspired vision of what the Institute should be, and do, Bill acted as a one man reality check: he helped everyone stay focused one one objective above all – that the Institute should make a positive and meaningful difference to design, and especially designers. That, it did. Bill’s clarity of focus, combined with his capacity to make people feel good about their work, made him an inspired choice as the Cooper-Hewitt’s Director. Institutions, at the end of the day, survive. Rare and much-loved individuals cannot be replaced. Bill Moggridge was the kindest of men, a truly good man. This is a cruel loss. This entry was posted in learning & design. Bookmark the permalink. Post a comment or leave a trackback: Trackback URL. He truely was one of the rare good guys. He will be missed. I love IDEO and the way they try to solve the design problems. Thanks to IDEO and Bill Moggridge.